We're living in an age of truly gorgeous Windows laptops. Microsoft Surface, Dell XPS, HP Spectre and Lenovo ThinkPad are just some of the models that spring to mind, but just about every top-tier manufacturer has a premium model geared to compete in the ultra-stylish, ultra-portable market. 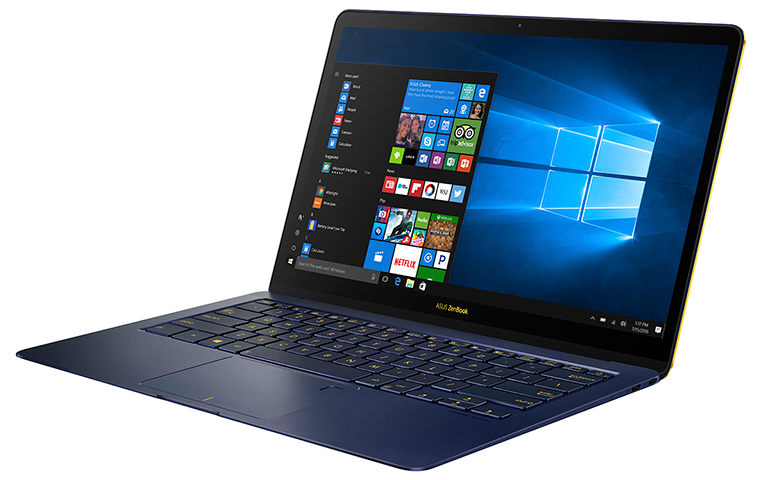 Asus's sexiest machines have been gathered under the ZenBook umbrella since 2011, and one of the latest models, dubbed the ZenBook 3 Deluxe UX490UA, claims, in no uncertain terms, to be an improvement on perfection. The product name doesn't exactly roll off the tongue, but Asus positions this eye-catching 14in PC as "an unrivalled combination of power and beauty," and after spending the last couple of weeks getting acquainted, we're ready to share our thoughts. Priced from £1,200, the UX490UA gets off to a positive start by looking every bit as expensive as it is. Asus's all-metal unibody aluminium alloy chassis feels well-crafted and practically seamless, while the signature spun-metal finish on the lid continues to provide a premium finish. 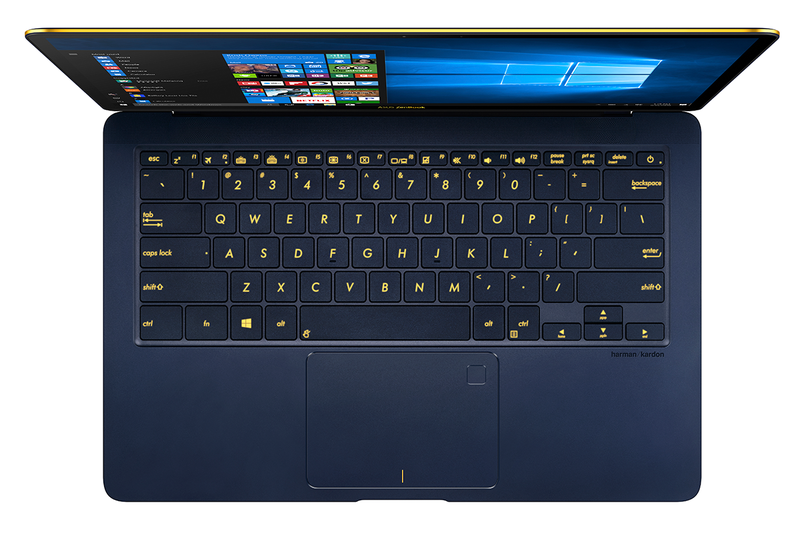 The goal is to ensure passers-by don't confuse the ZenBook 3 Deluxe as just another laptop, and to that end Asus implements golden highlights along the chassis' chamfered edges. Don't panic - the effect looks garish in the official product shots, but it's far more subtle in person and coordinates nicely with the Asus logo on the lid and the gold-coloured lettering adorning the backlit keycaps. It is a beautiful bit of kit, albeit prone to fingerprints, and it comes in quartz grey if royal blue isn't your thing. Conforming to our expectations of a premium modern-day laptop, it's also ludicrously thin, measuring a hair under 13mm at its thickest point and despite housing a 14in screen, the UX490UA is a similar size to most 13.3in systems courtesy of petite, 7.5mm bezels. They don't come much thinner than this and a weight of 1.2kg makes it effortless to carry around. 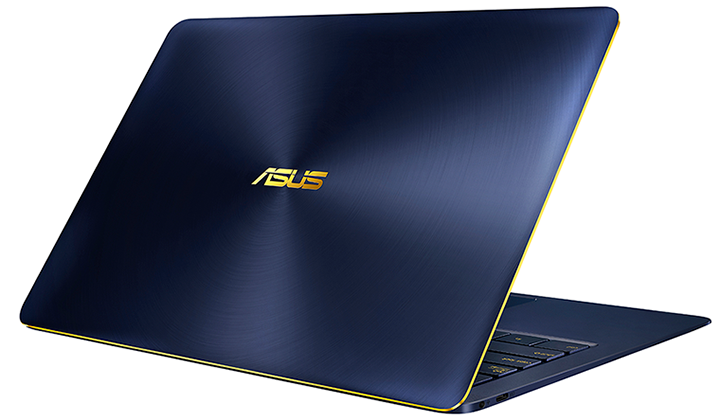 Asus has the 14in form factor down to a tee, yet when you get past the initial allure, the ZenBook 3 Deluxe is arguably lacking a killer feature to set it apart from the competition. It's a sign of the times that a laptop as pretty as this can be deemed ordinary, but while others are pushing digital pens, face recognition, convertible form factors, fanless designs and over 10 hours battery life, the UX490UA seems relatively sedate. 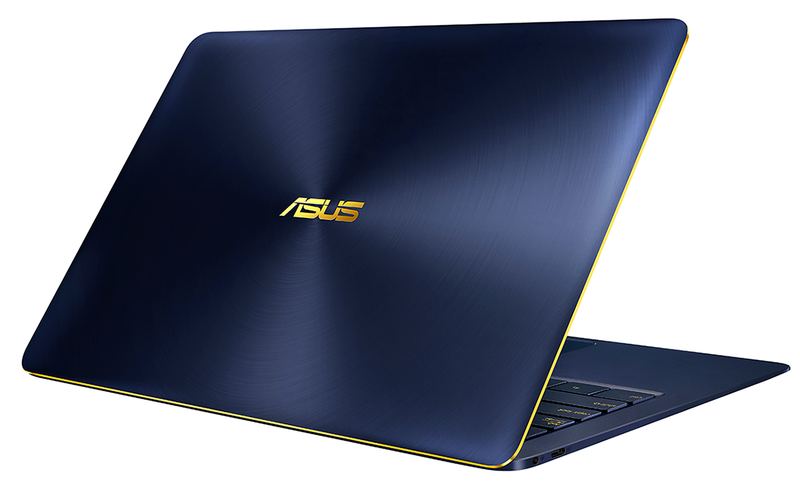 On the other hand, if you prefer your laptop to keep things simple, the Asus machine comes equipped with the essentials you'd expect, including an Intel Core i5-7200U processor, 8GB of memory, 256GB SSD and a full-HD IPS display coated in a 0.6mm layer of Corning Gorilla Glass 5 for extra toughness. Need a little extra oomph? There is a Core i7 variant with 16GB of memory and a 512GB SSD, but said upgrades push the price to £1,600. 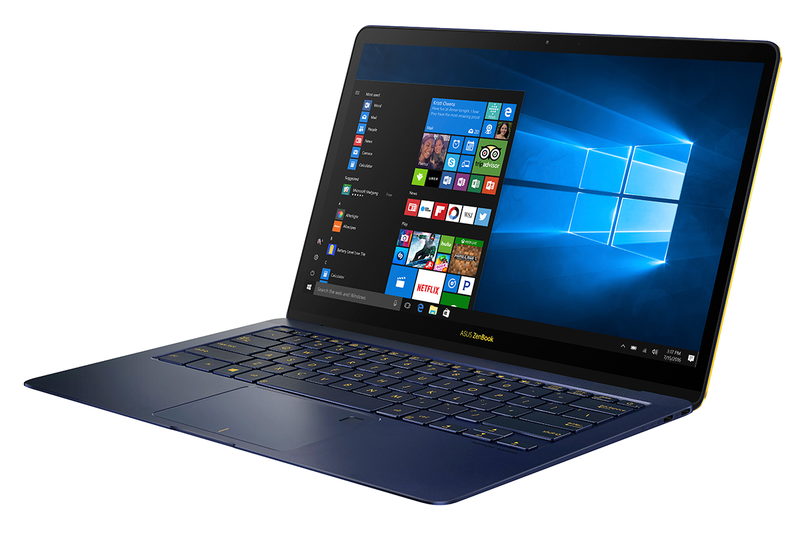 ZenBook 3 Deluxe has the makings of a very good laptop, but there are a few potential niggles to be aware of. The keyboard is satisfying to use, with a good amount of key travel and even backlighting, but Asus has opted to put the power button in the top-right corner, where you'd expect to find delete, so don't be surprised if you accidentally enter standby from time to time. Similarly, the precision trackpad is large and responsive but unnecessarily impeded by an embedded fingerprint reader that could be placed elsewhere, and though the glossy display looks like it's begging to be touched, Asus doesn't include a touchscreen in any UX490UA model. Connectivity can be a sticking point on machines as thin as this, but the ZenBook is reasonably well-stocked with built-in Wireless AC and Bluetooth 4.1, a headphone jack and a trio of USB 3.1 Type-C. Two of the three USB ports support Thunderbolt 3, allowing for the laptop to drive a couple of high-res displays, and though one port is used for charging via the bundled 60W supply, there's room for a couple of peripherals. Asus includes USB Type-C adapters for both Type-A and HDMI connectivity, helping ease the transition to the newer interface, and the laptop is largely free of bloatware, with McAfee LiveSafe and a couple of Asus utilities being the only additions to an otherwise clean install of Windows 10. Surprisingly, the integrated four-way speaker system packs a genuine punch, but while audio quality is good, the low-resolution VGA webcam is disappointing. The pertinent questions, we feel, are whether or not a laptop so svelte can deliver in terms of low noise and long battery life. Let's get some answers.